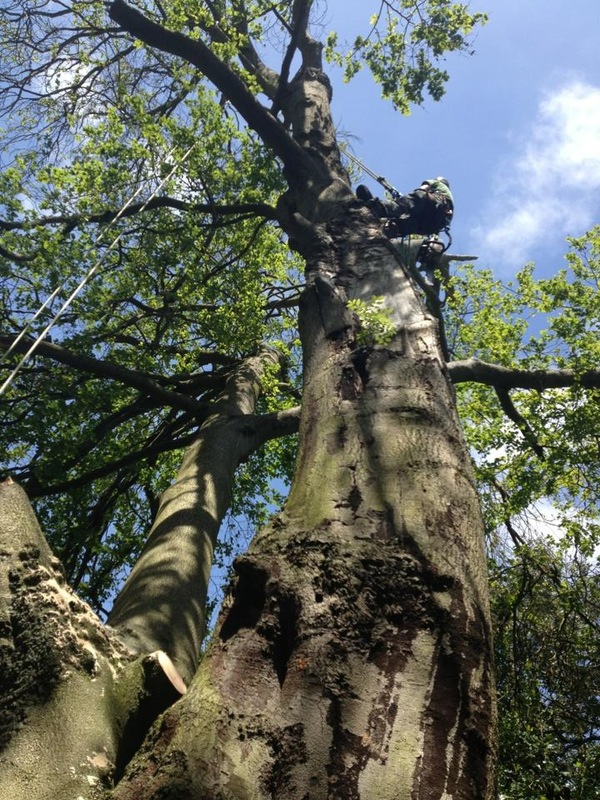 One of the jobs for our tree surgeons in Norwich Norfolk this week was to sectional fell the large Beech…The tree was part of some remedial works to carry out after we had completed a risk assessment survey/ report. The tree was located on a site we have been managing for the last 6 years and in this time the tree has been in slow decline, we removed a mature Copper Beech 2 years ago from this same site because of Meripilus giganteus (giant polypore). We did a full climbing inspection 2 days prior to the tree removal date, this was to inspect for bats and nesting birds as the tree structure had several cracks and holes suitable for bat and bird habitat, instead of complete removal we decided to leave the tree trunk as a conservation monolith at a height of approximately 3m. The tree had to be climbed as there was no access for a MEWP (Mobile Elevated Work Platform) but luckily there was a suitable anchor point in a neighbouring tree in which to install the main climbing line as the tree in question was not really stable enough to climb. The day started with all the pre start checks like the risk assessment and again checking for birds before any work was carried out. All the brash and wood were going to be stacked up around the site creating habitate piles. The work took approximately 6hrs for a 3 man team to complete.